I struggle with making lunch. Packing my daughter’s lunch for school seems like enough work. Trying to come up with ideas for my husband’s lunch or my own often feel overwhelming. So when I figure out something easy and quick that doesn’t take a lot of effort, I run with it! 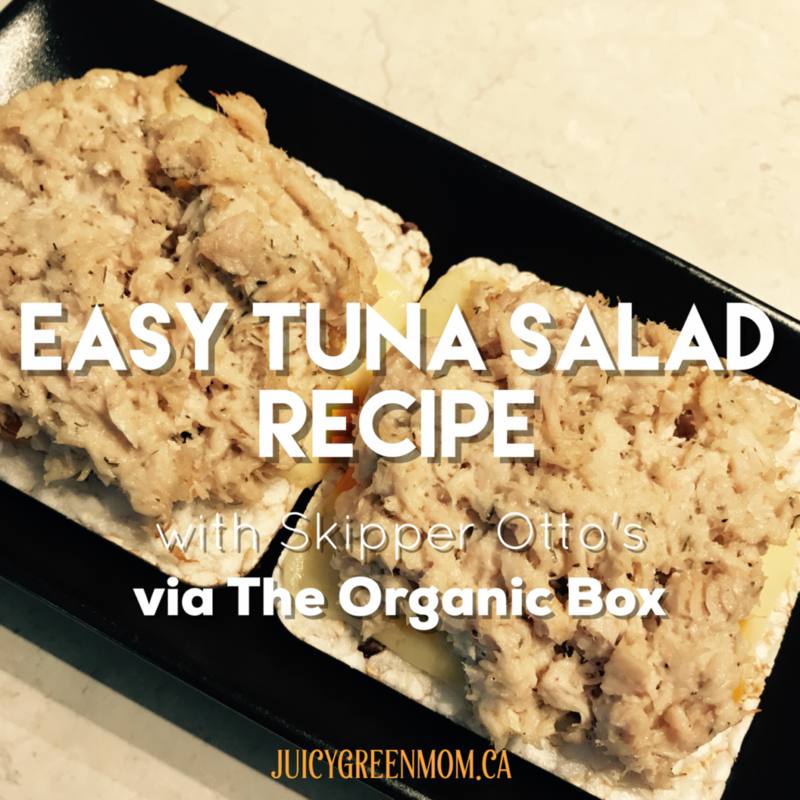 Presenting an easy tuna salad recipe with Skipper Otto’s via The Organic Box! I stopped buying canned tuna for several years because of all the controversy with farmed seafood. When I discovered that The Organic Box carried Skipper Otto’s Community Supported Fishery products, I got very excited. Skipper Otto’s is a family run business in British Columbia, and the Community Supported Fishery (CSF) ensures that fishing families are connected with community consumers. This means the seafood is sustainably harvested, and fishing families get a fair price for their product. You can purchase a share of the catch before fishing season starts and become a member of Skipper Otto’s CSF, or you can access products through The Organic Box. Cool, right?? 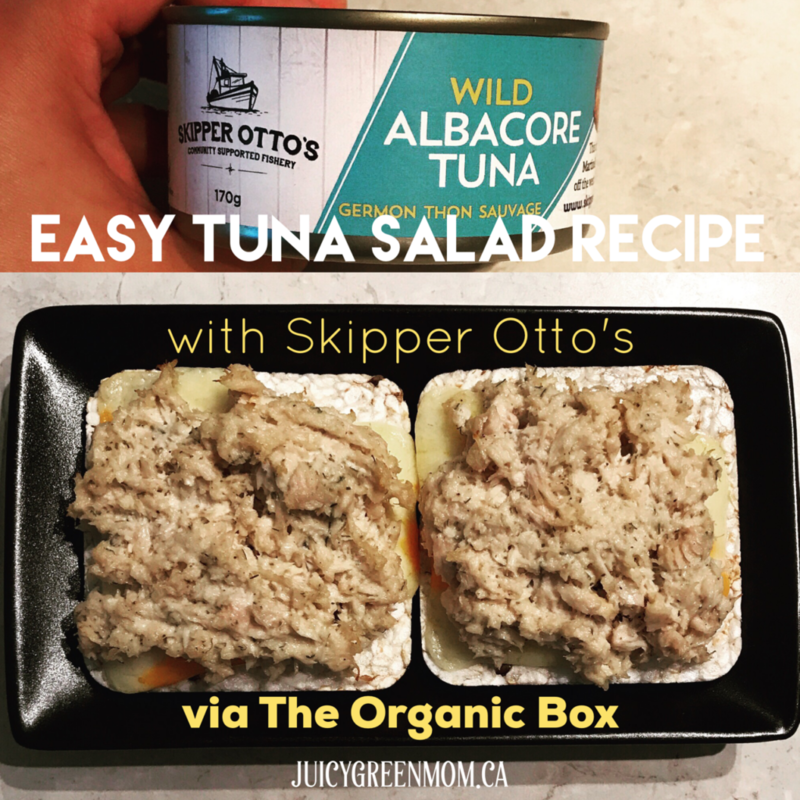 I used a can of Skipper Otto’s wild albacore tuna for my easy tuna salad recipe. It just takes a few minutes to throw together, and then you can use it for sandwiches, tuna melts, put it on rice cakes, bagels, rice, salad, whatever you want! Super versatile! Throw this easy tuna salad together in minutes and use as a sandwich filling, rice bowl topping, salad topping, anything you want! Drain the liquid from the can of tuna. I made an open faced tuna melt on rice cakes with my tuna salad for lunch! You can get canned or frozen fish from Skipper Otto’s through The Organic Box, as well as all the other organic ingredients you need for this recipe. Use my coupon code GREENMOMS to get $20 off your first purchase of $50 or more at The Organic Box! What’s your favourite tuna recipe?